– Up to 2.0 megapixel high resolution. – Full HD 1080P, Max. 1920 × 1080 @60fps. – H.265, H.265+, H.264+, H.264. – 120dB Wide Dynamic Range. – 3D Digital Noise Reduction. – 12 VDC & PoE (802.3af). – IR range: up to 30m. Image Sensor: 1/3″ Progressive Scan CMOS. Min. Illumination: Color: 0.005 lux @(F1.2, AGC ON), 0 lux with IR. Shutter Speed: 1/3s to 1/100,000s. Lens: 3.6 mm, horizontal field of view: 86.4°. Day & Night: IR cut filter. Operating Conditions: -30 °C to +60 °C (-22 °F to +140 °F), Humidity 95% or less (non-condensing). Power Supply: 12 VDC 25%, 5W. PoE(802.3af, class 3), 6.5W. IR Range: Up to 30m. [After-Sale Service] Dear friend, if you have any problem, please send us Email via your Amazon account. Free return & exchange service within 60 days and free technical assistance. Our friendly and effective after-sale service will put your worries aside. POE(Power Over Ethernet) Camera: Single cat5 cable for both Power and Data transmission. Resolution: 1080P 2.0 Megapixel Effective Pixels: 1920(H) x 1080(V)@60fps. 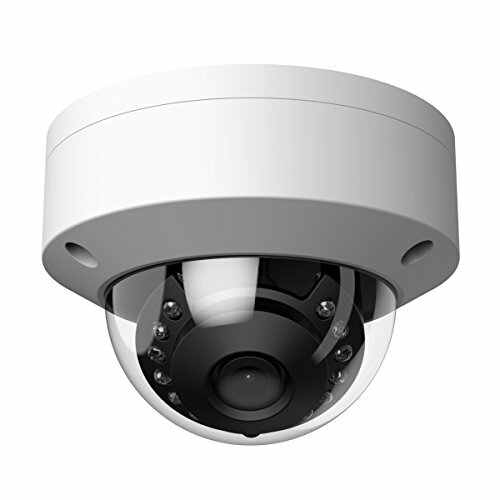 Full HD IP PoE dome security indoor camera support H.265, H.265+, H.264+, H.264. Auto Day and Night Video Suveillance with IR CUT, IR range up to 30m. Support Environment Noise Filtering.